July 18, 2015 (Beaver Creek Resort/Avon, CO) – Josiah Middaugh and Flora Duffy captured the 7th annual XTERRA Mountain Championship off-road triathlon pro race titles on a picture perfect day at Beaver Creek Resort in the Rocky Mountains around Avon, Colorado on Saturday. It’s Middaugh’s third straight win on his home course and fourth in five years. It’s also his second win in a row on the XTERRA U.S. Pro Series and puts him in prime position to capture his third straight Series title in Utah this September. Of note, Middaugh won his first-ever XTERRA major at the Mountain Championship when it was held in Keystone, Colorado in 2004. This is his 16th career XTERRA title. The 36-year-old from Eagle-Vail, Colorado is living proof that you can’t win the race in the swim. He exited the 68-degree water of Nottingham Lake about 2:30 back of rookie Eli Hemming and the established XTERRA core of racers Branden Rakita, Brad Zoller, Braden Currie, and Ben Hoffman. At mile 3.5 Currie had nine seconds on Hoffman, more than a minute on Rakita and Rom Akerson, and Middaugh was 1:35 back. By T2 after several thousand feet of climbing up the mountain Middaugh had a 40-second lead on Currie and one-minute on Hoffman. Two miles into the run that lead had stretched to two minutes and he crossed the line in 2:07:26, followed by Hoffman in 2:09:10 and Currie in 2:10:50. Josiah had this to say about his march up the mountain. “Ben and Braden had a pretty big lead out of the water and they kept that lead all the way up the first climb. I reeled them in at about mile ten on the bike so I had a lot of work to do to get to them. I tried to put a little bit of a cushion on them coming into the run. Luckily I had 40-50 seconds coming into the run. It’s Hoffman’s second straight runner-up here, and he was third in each of the previous two tries. With his third-place showing today Currie moves into 2nd place in the XTERRA U.S. Pro Series standings and could take the Series with a win at the USA Championship combined with a third-place or lower finish by Middaugh in Utah. XTERRA Costa Rica Champion Rom Akerson finished in fourth and Alex Modestou placed fifth for the second straight season. 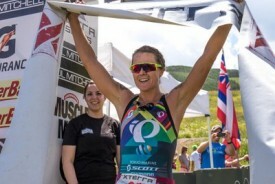 In the women’s race the reigning XTERRA World Champion Flora Duffy’s reign of dominance continued. A week after finishing third at the PanAm Games road triathlon in Toronto, Duffy proved she’s just as strong on a mountain bike and trails. The 27-year-old from Devonshire, Bermuda had the fastest swim, bike, and run to take the tape in 2:22:41, more than six-minutes ahead of runner-up Emma Garrard. The victory marks her 11th XTERRA win in her last 12 tries since the start of the 2014 season. After catching her breath at the finish Flora had this to say about her race, “I made sure I didn’t go out too hard. Swam within myself. I came out onto the bike feeling pretty good. Much better than I thought. Again tried to ride within myself. I had a power-meter on my bike so I knew what watts I wanted to ride. Stuck to those. Tried to keep it smooth through any technical bits then onto the run… the run hurt… a lot. Unbelievable actually. I was just survival mode out there. Went out hard to the top of the hill then worked on good turnover on the descents. Behind Duffy, Emma Garrard was having a great day of her own. She posted the third-best swim, got ahead of Sara McLarty early on the bike and had the second-fastest ride and run times to finish in 2:28:43, nearly six-minutes ahead of Schuler. The men’s and women’s XTERRA U.S. Pro Series title chase will come down to the final race at the USA Championship in Ogden, Utah on September 19th. Both current leaders – Josiah Middaugh and Emma Garrard – control their own fate and can secure the crowns with a win at Nationals (or by simply finishing in front of Currie and Snyder, respectively). For Currie, a win combined with a 3rd or worse from Middaugh would score him the Series win. For Snyder, a win in Utah would be enough to overcome Garrard, and their are several other possibilities based on outcome that become fairly complicated. Joshua Merrick from Alamosa, Colorado finished eleventh overall and roughly two minutes faster than Bryce Phinney of Broomfield, Colorado to capture the men’s amateur title today. Sonora, California’s Julie Baker was the sixth overall woman and top women’s amateur. Finishing three minutes faster than former XTERRA Amateur World Champ Elizabeth Gruber from Colorado Springs, CO.
Next up: The XTERRA USA Championship at Snowbasin Resort near Ogden, Utah on September 19. The XTERRA Mountain Championship was the 26th of 40 events where the fastest amateur athletes from around the world can qualify to race at the 20th annual XTERRA World Championship at Kapalua, Maui on Nov. 1, 2015. The XTERRA Mountain Championship was presented by Paul Mitchell and XTERRA Travel, and sponsored by Beaver Creek Resort, Muscle Milk, Gatorade Endurance, PowerBar, XTERRA Optic Nerve, LifeProof, Greenlayer, XTERRA Coffee, the town of Avon, XTERRA Wetsuits, XTERRA Fitness, Utah Sports Commission, Salming, XTERRA Boards, and Outrigger Resorts. TEAM Unlimited is a Hawaii-based television events and marketing company, founded in 1988. It owns and produces XTERRA and in 2015 will offer more than 300 XTERRA off-road triathlon and trail running races in 35 countries worldwide. In addition, TEAM TV has produced more than 300 adventure television shows resulting in three Emmy’s and 42 Telly Awards for production excellence since 1990. View samples at www.xterra.tv, and learn more at xterraplanet.com and xterratrailrun.com.